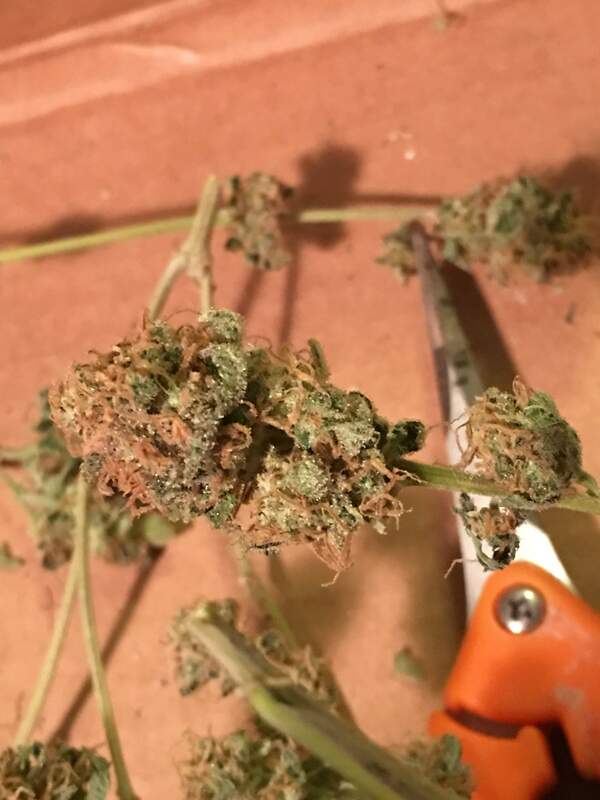 Thank you Bomb Seeds—this grow was the bomb! I can’t tell you how easy these plants were to grow! They germinated easily, thrived in my little shower grow, tolerated my newbie handling, me being away for 2 weeks at Burning Man, 2 transplants, spider mites, power fluctuations and my PTSD from The Thomas Fire. They trained nicely, resisted a fungus gnat invasion, pmd, and were never fussy about nutrients. My only complaint was getting a ball, and it’s hard to complain because I keep my grow space open and it’s not well light sealed. These were also easy to trim without a lot of leaves in the bud. I dry trimmed and I went pretty easy on it. The best thing about Ice Bomb was the scent of these big ole buds! Much of the flower it smelled like vanilla and sugar. Towards the end, the scent deepened into a milk chocolate. The color got a little rosy but mostly I got good sized chiffon buds loaded with billowy yellow calyxes and brown hairs. Very sweet flavor, lots of frost! Great for a stealth grow because it’s less skunk and more floral. I let trichomes go to about 30-40% amber. The buzz is very strong, heady, with a good body stone. The texture of the buds is like spun sugar after some cure. For my next grow I would like to add more light or switch up to COBs move into a larger space, be it a tent or a diy grow room, augment my soil with coco as well as perlite, if not switch mediums entirely, be more gentle with transplant and add enzymes and bloom boosters to my supplements. Thank you Bombseeds for sending me these fantastic beans and for your help and support. Thank you to WhiteWidow for hooking me up with Terpinator, and special thanks to Terpinator for sending me your very easy to use and effective product. I am a 54 year old woman with a California Prop 215 compliant medical grow. Cannabis helped me detox off of bupenorphine (Suboxone), an opioid medication used to treat opioid dependence. I was on large doses of fentanyl and morphine for several years prior to Suboxone, and at one point was taking 17 prescription medications for neuropathic pain caused by a spinal cord tumor, endometriosis and interstitial cystitis. I am currently off all prescription medications and continue to use cannabis for pain and stress reduction, primarily in the evenings. Being able to grow my own has offered me more control over quality and trichome ripeness, both of which are crucial to effectiveness for me. Follow me on Instagram @thefairybudmother if you would like to know more about me and share in my advocacy of cannabis as medicine. I believe all cannabis use is medicinal use. To your health! I can zero a scale! This stuff is very easy to use. I only used half the recommended amount but I probably could have pushed it. Ph Neutral, low ppms. Definitely encouraged frosty buds. Smells nice too. I will continue to use it! This was a long grow! Thanks for hanging in there with me. Mostly thanks to Bomb Seeds, my friends here and in Wolfpack who have been so supportive, and Grow Diaries for providing a great learning platform and community for home growers. @biggreens420, Thanks, appreciated! I recommend growing you own bomb sometime! Im glad that you have this awesome medicine at your disposal. Im looking forward to your next adventure in growing your own medicine. @CBD_Sweden, thanks! This strain btw has a good amount of CBD, but it’s pretty high potency with THC as well. I like it a lot.